The 17 Tropical Wave Slide features an easy-to-use water misting system that you will not have to remove and install or constantly re-adjust. 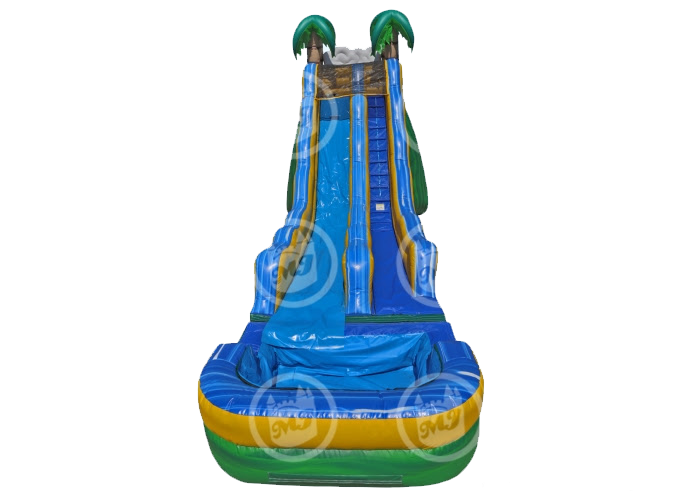 The climbing area, top landing platform, and pool areas feature a unique non-slip material for a safer experience when being used as a water slide. The 17 Tropical Wave Slide has a full pool with a raised wall for safety and to prevent water from splashing out. For states that do not allow pools, we can swap out the pool for a landing mattress. Drain flaps at the bottom corners allow for easy removal of any water that may get trapped inside the inflatable.